The Haines Group have introduced the Ensign 370 Sailing Dinghy to suit the leisure needs of families. Despite reports 75 percent of Australians want to spend more time with their families, there has been an increase in the average number of hours Australians are spending at work Australian Bureau of Statistics (ABS) Data. With this in mind, Australia’s largest family owned recreational boat manufacturer and distributor has incorporated a family-friendly vessel to encourage time starved families to get out on the water in a stress free environment. New to the market, the Ensign™ 370 Sailing Dinghy combines traditional sail boat design features with modern technology. The Ensign™ range is manufactured using polyethylene – making them positively buoyant, virtually unsinkable and extremely hardwearing vessels. This family sailing boat has been described by Managing Director (Sales and Marketing) Greg Haines as an affordable and fun way to spend time with loved ones; and a cost effective way to get into boating. “The boats multifunctional capabilities will suit the needs of families as it is much cheaper than traditional fibreglass or wooden boats. It’s easy to handle and can serve under outboard power, sail or oars if you are feeling fit. “Most importantly for the user, the design of the boat ensures a sturdier, safe and easy ride,” Mr Haines said. “The boat is level flotation laden which makes for a very safe and stable dinghy, as it can be easily corrected in the unlikely event it capsizes,” Mr Haines said. The unique polyethylene used to make the Ensign™ 370 Dinghy makes this boat up to five times stronger than wooden boats; guaranteed to take the hard knocks in the coral and rocky coastlines. 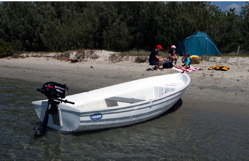 The Ensign™ 370 Dinghy has a very simple sail configuration which Mr Haines said is effortless to assemble and is easily sailed by one person; however there is sufficient seating for up to four adults plus room for gear. “It can be prepared for sailing within 15 minutes and even a junior sailor would have no problems stepping the mast,” Mr Haines said. Back on dry land, the boat can simply be stored on the garage floor without fear of damage. Any superficial scratches can be simply removed from the thermoplastic material with the application of heat. The craft requires much less maintenance as the colour is consistent throughout the polyethylene. Retailing for approx $9,150, The Ensign 370 is a good investment for the whole family, allowing time out in the fresh air, team work and is a good way to get the kids away from television and video games. “The sailing rig is easy to manage and easily fits into most family cars,” Mr Haines said.